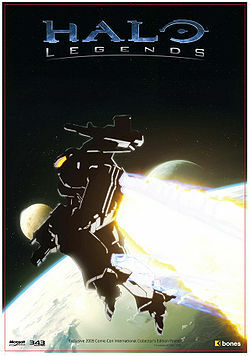 Prototype is one of the seven short films in Halo Legends, the anime adaptation of the Halo universe. The story follows Ghost, a UNSC Marine sent to Algolis to destroy a prototype powered armor. When he arrives, he finds the planet is still defended by humans who are under siege by the Covenant. The suit is their only hope for survival. Two Marines—Ghost and an unnamed female—take shelter in a forest on an unknown planet, surrounded by their dead comrades. The female marine asks her Sergeant about his call sign, "Ghost", while he dispassionately treats her wounds. With her dying words, she asks him, for once in his life, to "be human". The Marine's death and last words leave the usually-emotionless Ghost deeply disturbed. Having "died on the inside," he cried out to the sky and vowed to avenge his fallen platoon. Three years later, the planet Algolis is under attack by the Covenant. The Marines defending UNSC Weapons Research Facility T12A are taking heavy casualties fighting Covenant air and ground forces, trying to buy time for the remaining civilians to evacuate. However, the Hades Corps of UNSC Engineers refuses to retreat until all weapons and navigational data are destroyed in compliance with the Cole Protocol. As Covenant forces began their final push towards the base, the HRUNTING/YGGDRASIL Mark I ADS the Marines were sent to destroy flies out of a nearby hangar. The suit is being piloted by Ghost, who disobeyed the Cole Protocol in an effort to help the planet's civilians and his Marines escape. Ghost single-handedly engages the Covenant forces on the ground and in the air, taking out large numbers of their forces easily. In the ensuing battle, Ghost is overwhelmed by ground infantry. The suit's shielding system starts to fail, and the suit is completely disabled when a plasma grenade severs its (and Ghost's) left arm. As Ghost struggles inside the disabled armor, he looks up at the escaping shuttles and flashes back to the female Marine's death. He admits that the moment she died in his arms, a part of him was lost and that he had become a "ghost"—a shadow surrounded by death. A countdown on the suit's HUD finishes, and the suit's system requests a voice command to activate a self-destruct function. Ghost turns to face the advancing Covenant for one last glance, and gives the voice command: "Be Human". The prototype suit explodes in a nuclear detonation, killing Ghost and all of the surrounding Covenant. As the evacuees rendezvous with a UNSC frigate in orbit of Algolis, Ghost's commanding officer reports that the Cole Protocol has been enforced, and that all navigational data and technology prototypes have been destroyed. He redacts his previous request for Ghost's court-martial, listing him as missing during heavy combat on Algolis and further stating that Ghost had demonstrated great conduct as a Marine and human being. He then informs of their rendezvous with the UNSC Heart of Midlothian. After the first cargo ship lifts off and is destroyed, the next scene shows a Phantom with a Type-26 Wraith in the troop bay. This is inaccurate as vehicles are actually carried on the underside of Phantoms. All Covenant species depicted in this episode have blue blood, despite the Elites and Hunters having purple and orange blood, respectively. Strangely, the frigate that the Marines retreated to following the battle on the surface knowingly rendezvouses with the UNSC Heart of Midlothian, while the Cole Protocol demands that if Covenant forces are detected, a random jump must be executed. However, as the Protocol also states that the jump must not be executed towards any human population centers, it is possible that the jump was not considered a violation. In his after-action report at the end of the episode, Ghost's superior officer rescinds his petition for Ghost to receive a "military court-martial". This is redundant as a court-martial is (as indicated by its very name) is a military court. This episode serves as a prequel to the story Midnight in the Heart of Midlothian from Halo: Evolutions - Essential Tales of the Halo Universe. Ghost and his actions are briefly thought about by Michael Baird at the beginning of the story and the UNSC Heart of Midlothian is heading to check out Algolis after hearing from the survivors. During the final battle between Ghost and the Covenant, a Grunt can be seen dual-wielding a plasma pistol and a plasma rifle. During the battle, the power of the prototype's firepower is inconsistent. At one point it takes three rockets to destroy a Banshee. In the next moment, Ghost destroys multiple Banshees with one rocket each. The cargo ships being used for evacuation are the same kind of cargo ships used for the same purpose during the Battle for Arcadia as seen in the Halo Wars level Arcadia City.